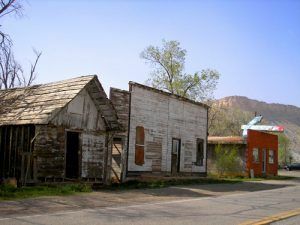 Though Thompson Springs, Utah still has a number of current residents, it is all but a ghost town today — not the typical type, such as the many mining camps of the American West, with crumbling shacks and rusting equipment lying all around; but rather, more like the many towns of Route 66 that died when the highway was replaced by the interstate. Though an exit still exists from I-70 into the town, it is a bit off the interstate, and its old businesses are all closed. The town began when E.W. Thompson, who lived near the springs, operated a sawmill to the north, near the Book Cliffs. Soon a small community grew up called Thompson Springs, made up of small-scale farmers, sheepherders, and cattlemen. However, there was one ambitious man in the area named Harry Ballard, an Englishman, who had plans of grandeur. A successful sheep and cattleman, Ballard began to buy up much of the property that surrounded Thompson Springs, and before long, owned a hotel, store, saloon, a several homes in the small settlement. Soon, the little community was large enough to convince the Denver and Rio Grande Western Railroad, which had been completed through the region in 1883, to add a stop in the settlement, Cattle and sheepmen welcomed the railroad, which soon became a small shipping point for their stock. A post office was established in 1890 and called “Thompson’s” after the original owner, E.W. Thompson. Sometime later, ambitious Harry Ballard discovered a large vein of coal on land adjacent to his ranch about five miles north of Thompson’s. Keeping his discovery quiet, he soon bought the surrounding property and started coal operations on a small scale. However, Ballard sold his operation to Salt Lake City investors in 1911, and the coal mining town of Sego was born, bringing more prosperity to the area. Thompson became even more important in 1914 when the Ballard and Thompson Railroad was constructed from the mines at Sego to connect at the Thompson railhead. 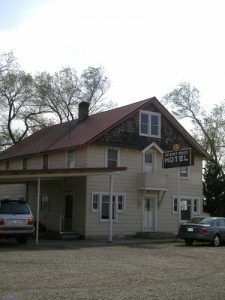 Though the town never grew very large, it contained two motels, a saloon, the railroad station, a couple of stores, a school, a restaurant, and a number of homes. In the meantime, commercial mining in was progressing rapidly, bringing out numerous loads of high-grade coal. Though the coal was in high demand; the mine suffered financial difficulties from the start, due to lack of water and management issues. Railroad operations to the mine ceased in 1949, which placed further operational issues on the mine. However, the mine continued in Sego Canyon until 1955, when the railroad began to use diesel engines, replacing the coal-powered steam engines and reducing the need for the mine’s products. Sego then became a ghost town. Unfortunately, Thompson wasn’t far behind. Another blow was dealt to Thompson when I-70 was built through the area in the 1970s. 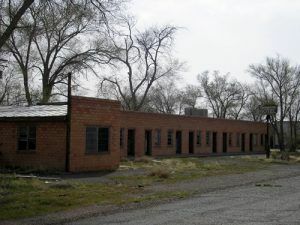 Thompson had survived the mining decline, as it was situated on a main highway through the area — NV-128, and provided services to travelers passing through the region. However, when the interstate was developed, the town found itself just a few miles north of the new highway and traffic through the small community dramatically decreased and businesses began to close. Those few remaining residents reinstated the original town’s name of Thompson Springs in 1985. 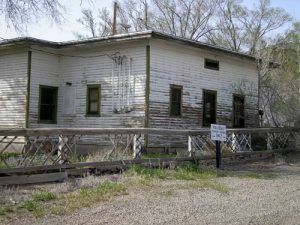 Though the railroad still runs through Thompson today, the final death knell occurred when Thompson’s flag stop station, which provided service for Amtrak travelers, was finally closed in 1994. Today, there is still an exit off of I-70 (#185) and a gas station right at the interstate, but the town itself is a mile or so on down the road. North of Thompson Springs, in Sego Canyon, Native American rock art and petroglyphs can be seen. 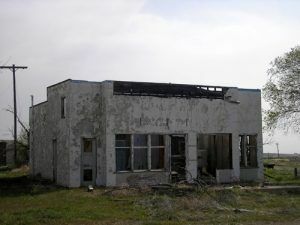 A bit further down the road is the ghost town of Sego.